Here's the next generation Marian Helpers exclusive tote! 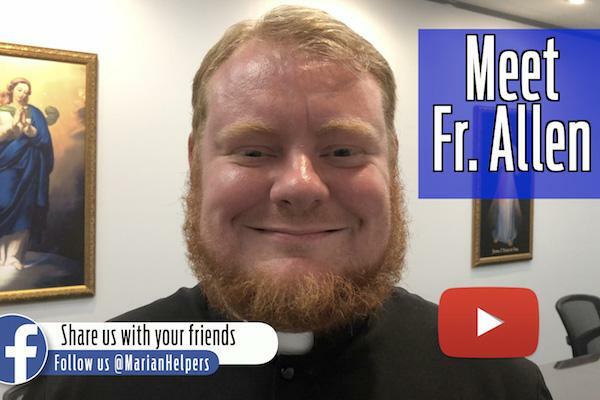 Father Allen Alexander, MIC, has been at parishes in Kenosha, Wisconsin, for the past three years. His new assignment, helping Marians in formation, brings him back to his alma mater. Hear why he's grateful. Hi Fr. Allen, this is Erin from Catholic University who was a freshamn there in 2014-15 while you were there studying! I was a part of Encounter the Spirit, which is where I think I first met you. Blessed be God for your ordination and these three years of priestly ministry! It's so good to see your smile...please keep my family and I in your prayers!!!! And my fiancé and I -- we will be getting married in November. God bless you, and may He hold you ever closer! Father Allen, didn't mention that he also was part time at St Catherine High School in Racine and the students all love him. Thank you for your service.